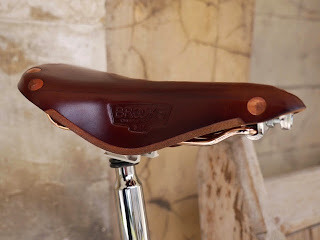 When I bought my original Orange Brompton, it wasn't that long before a Brooks saddle was placed on it. For me Brompton and Brooks makes a very successful marriage and enhances a Brompton bicycle. Always a fan I have recently developed a new found appreciation of just how good they are. When I bought my new P Type I made sure I had the Brooks B17 Special Edition chosen as part of my bespoke order. 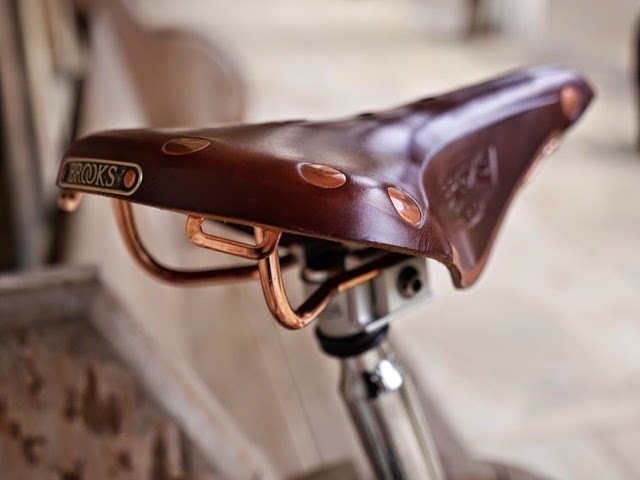 It really is a lovely saddle and I especially like the copper rails. I normally commute in various cycle specific items of clothing - padded shorts. However, for the last two weeks I have for one reason or another abandoned this and cycled to and from work in a suit. My commute is not terribly long - about 5 miles there and back - but by Friday, I had come to the conclusion that my Brooks saddle was particularly comfortable. Early this morning at stupid o'clock I ventured out for a fairly nippy 30+ mile spin. With my usual padded winter cycling tights in the wash I had to go out without them. When starting out I was initially worried that I wouldn't be comfortable but by the time I had finished the ride I had rediscovered just how good a Brooks saddle can be. The ride consisted of cobbles and a couple of seriously steep South London hills. They aren't for everyone of course. Some just can't get on with them and eBay is occasionally littered with almost new examples. For me, all my Brooks saddles seemed to be comfortable from the word go and didn't need the much fabled 'breaking in' process. So there I was this morning, sitting on the train with my Brompton, when someone sits opposite me with an orange Brompton! I was tempted to ask if it was "the" orange Brompton, but chickened out. I noticed it had a distinctive saddle though, so thought I'd check the blog to see if it was the one, and lo and behold there's a post just yesterday on the very saddle! So, belatedly, hi! I might say it out loud if you get the same carriage again...! Hello Andy. Sadly is wasn't me. 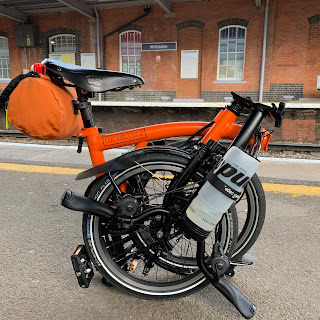 I don't know how long you have been reading my efforts but I don't like public transport and only seem to use trains and other forms when going to or on a longer Brompton adventure. If you are London based or can get to it, there are lots of rides you could join in on. (Email me via the address on the blog if you want further details). In the meantime, keep peddling. Nothing. Those rails seem to stay like that.